Your horse’s mind is an amazing place, but understanding the basics is an absolute necessity in order to effectively train it. The reality is I want to change the horse’s natural instinct, reaction, and teach it to think first. The way horses are programmed has helped them to survive in the wild, without the help of man, but I need to build a partnership with the horse so it will trust me. Obstacle training can help accelerate this process of thinking before reacting. I find a well thought out mountain trail or obstacle course teaches the horse to move with boldness and confidence through the most difficult obstacles. Good training allows us to use the horse’s instinct to our advantage, but this doesn’t happen naturally. We must enter their world, train under their rules and learn their language. Instinct isn’t good or bad, right or wrong. It simply exists. The animal world is full of this kind of intelligence, but humans are not well equipped to understand it. The horse is not superior or inferior to us, they simply live and move with a brilliance of senses we have lost or never acquired. To say we are better, smarter, or more sensitive than horses is a great mistake. If a trainer thinks in those terms he will never achieve an inspiring partnership with the horse. A true partnership is where both horse and rider depend on each other and is where the beauty of mountain trail course training is seen. With obstacles that move, things to jump and rocks/logs/water to cross the horse and rider must learn to trust each other. Because of this, mountain trail/obstacle training benefits every breed and crosses every discipline. Recently my training day included working with a pony, three warmbloods, one Arab, a mustang and a number of Quarter Horses. While training remains basically the same for all, there are slight variations depending on the personality and temperament of the horse. 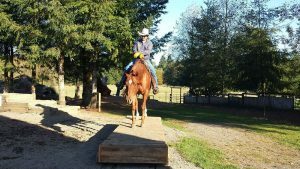 In the end, we all want a great horse to ride, whether it’s on a mountain trail or in the show ring and obstacle training is a wonderful way to start. Good riding and ground skills, along with learning to listen to the horse, is the start of a partnership. It sounds simple but this isn’t easy. Listening is both a science and a natural gift. Listening begins, of course, by knowing a common language. The horse may not speak, but its voice is clear. For instance, if a horse doesn’t want to step up and onto a platform, it will let you know simply by blowing and shaking its head. If it wants to please you and attempts to step up, it may sniff or paw at the platform. Such behavior forms part of the basic exchange of information. The horse lets you know how it feels, you understand and then you give it clear signals to proceed, reassuring it. Like any exchange of information, both horse and handler must partake in the listening process. The horse must also be willing to listen to instructions that the handler gives. To achieve that the handler must communicate in a clear manner, in the horse’s language, so the horse will keep listening. The skills for listening to the horse are obtained only when you understand the horse’s world and learn to imitate equine language. When this art is mastered, then the instinct of the horse to follow a strong leader will kick in and override the fear of the unknown. This leads to trust, then boldness and confidence. Instinct is hardwired from birth, and to try to go against it is much more difficult than simply working with it. If certain behavior is exhibited by a human then instinct will block the horse from listening or trusting. At that point any training becomes mechanical. As a leader and teacher my job is to inspire the horse to achieve that which it felt was the impossible. My focus is never to master the obstacle; I use the obstacle as a tool to master and to build the mind of the horse. In the right hands, I know of no other tool which can build boldness and confidence in both the horse and rider in the way a mountain trail course does. This is why so many are springing up around the globe.